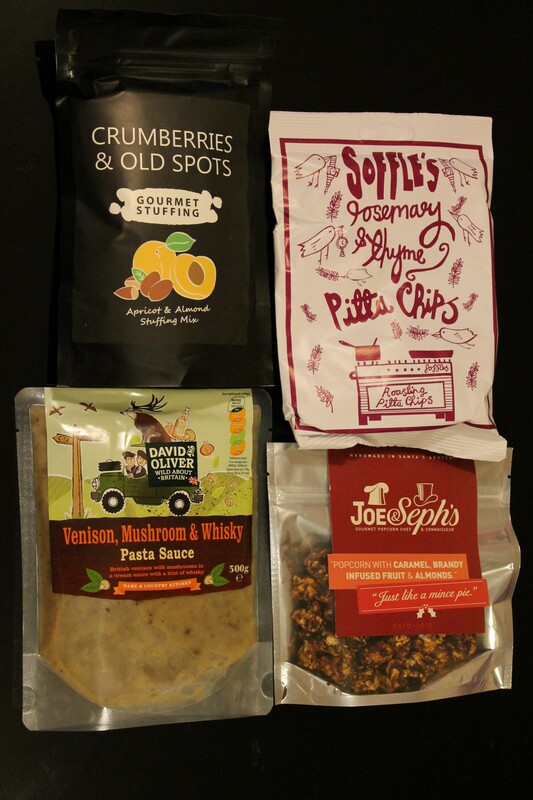 Flavourly box, December 2014 – Tasting the World – On the road, with stuffed hand luggage and face. Camera in my hand. 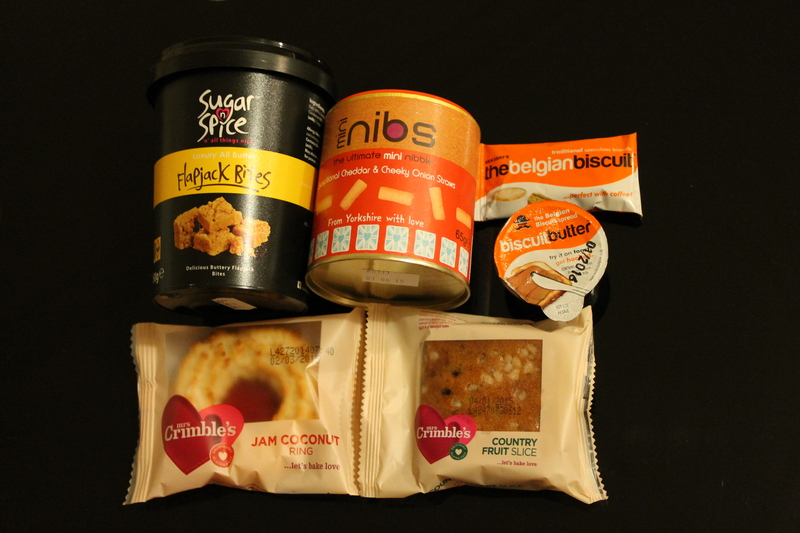 I received the last Flavourly box nearly two weeks ago, but because I went home for Christmas, I didn´t have time to write about it. Now I´m back, so here is the post! jam coconut ring and country fruit slice by Mrs Crimbles. Both look yummy, one day I will take them to work as a sweet snack. I received the savoury straws before, so I know they taste good. I didn´t try any of the sweet things, because after Christmas I suffer from sugar overdose, but after I finish all the Christmas sweets, I will dig in! As you can see, in the box there also were 4 small plastic pots. What was in them? 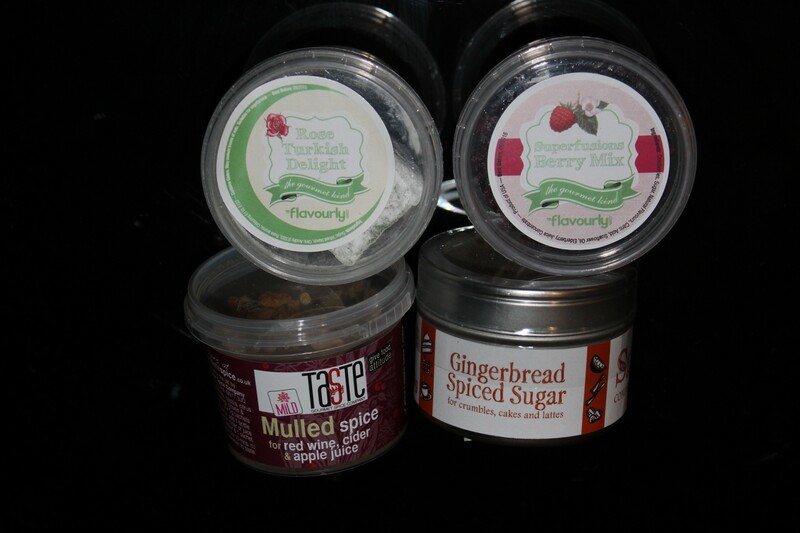 Rose turkish delight and Superfusions berry mix by Flavourly, mulled spice mix for red wine, cider and apple by Taste Gourmet Spice, juice and gingerbread spiced sugar for crumbles, cakes and lattes by Saison. I am quite looking forward to trying out this one. There was also a recipe card for gingerbread spice apple crumble, so I already have inspiration! apricot and almond stuffing mix by Caos Stuffings. I think I have never used any stuffing like this before, so I am very curious what dish it could be good for. Any ideas? Soffle´s rosemary and thyme pitta chips. They are oven roasted, so there´s no fat from the deep fryer. And I like the package design very much! popcorn with caramel, brandy infused fruit and almonds by Joe and Seph´s. I had two different packs of popcorn and both of them had a totally different taste from what you´d expect from regular popcorn. I´ll let myself be surprised by this one as well. In the box there were two discount vouchers, one for these Flavourly boxes, one for the Flavourly Craft Beer Club (again, if anyone wants them, let me know), and of course the Meet the makers guide. This time I would like to note one more thing – if you´re from the Czech republic or Slovak republic, you may want to know that there´s a Czech equivalent to these Flavourly boxes and they ship to Slovak republic as well (I´m not sure if I didn´t mention this in one of my earlier Flavourly posts, but I feel like doing a good turn today and promote them a bit). It´s called Zajíci v krabici and it offers similar-style products for similar price. I ordered it for one of my relatives and she liked it. Did you try it as well? What was your opinion? If you want to share it, feel free to comment, even in Czech, although all my Flavourly posts are in English only. So that was it (at least for this year). I´d like to wish you a great year 2015 with lots of good food!